Timely diagnosis and management of cutaneous disorders in the lower extremities are key concerns for many clinicians across various medical specialties. Skin Disease Of The Lower Extremities: A Photographic Guide offers an essential comprehensive resource in a convenient handbook format for clinicians who see lower extremity dermatology issues every day in their practice. Full of compelling clinical photography, the handbook offers practical insights in 15 chapters on topics ranging from xerotic disorders and skin of color to nail disorders and benign and malignant lesions. Tracey Vlahovic, DPM, and Stephen M. Schleicher, MD, the co-authors of the handbook, agree that the book will serve a strong need among clinicians. “Cutaneous disorders of the lower extremities are frequently encountered by both podiatrists and dermatologists. Many are readily diagnosed by visual inspection and others may require additional testing such as culture and/or biopsy," notes Dr. Schleicher. "Our text ... is a valuable resource for any clinician who deals with lower extremity skin disease." For more information or pricing on bulk orders (i.e., more than 10 copies), please call 800-237-7285 x 246. The Skin Disease Of The Lower Extremities handbook offers a concise but comprehensive guide to lower extremity dermatology, ranging from chapters on nail disorders and eczematous disorders to blistering disorders and benign and malignant lesions. The handbook also offers chapters on diagnosing lower extremity dermatological conditions in skin of color, how to perform biopsies and a guide to current dermatologic therapies. The text is written for podiatrists, dermatologists and other clinicians who diagnose and treat lower extremity skin disease in an office, hospital or other healthcare setting. The handbook serves to enhance the reader's understanding of lower extremity dermatology and facilitate timely diagnosis and treatment. The Skin Disease Of The Lower Extremities handbook is available for just $39 per copy, plus shipping & handling. 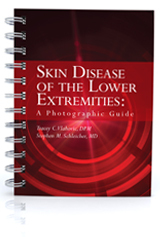 Tracey Vlahovic, DPM, and Stephen M. Schleicher, MD, the co-authors of Skin Disease Of The Lower Extremities, agree that this comprehensive resource in a convenient handbook format will be welcomed by clinicians who see lower extremity dermatology issues everyday in their practice. "During my travels to podiatric medical conferences, I have spoken with numerous clinicians who expressed a need in our profession for a convenient text to assist in the diagnosis and management of lower extremity skin disorders," notes Dr. Vlahovic. "We hope we have met that need and that (the handbook) can be a useful reference for any clinician who treats skin conditions of the lower extremity." "Cutaneous disorders of the lower extremities are frequently encountered by both podiatrists and dermatologists. Many are readily diagnosed by visual inspection and others may require additional testing such as culture and/or biopsy," says Dr. Schleicher. "Our text, co-authored by a board-certified podiatrist and a board-certified dermatologist, is a valuable resource for any clinician who deals with lower extremity skin diseases." Jeff Cieszkowski, a National Account Manager for Podiatry Today, acknowledged interest in bulk orders of the Skin Disease Of The Lower Extremities: A Photographic Guide handbook from pharmaceutical companies. "Educational resources such as this are well within the AdvaMed guidelines," notes Cieszkowski. "This resource is a very cost effective way for sales representatives to facilitate a stronger awareness of lower extremity dermatology issues among clinicians." HMP Communications publishes 14 medical journals including Podiatry Today and The Dermatologist. Podiatry Today is an award-winning, premier publication that emphasizes informative clinical features and columns as well as practice management features. Podiatry Today is the only BPA-audited journal that reaches every practicing podiatrist in the United States. The Dermatologist, formerly known as Skin & Aging, is an award-winning journal that provides practical and clinical insight into today's dermatology issues. HMP Communications has spent the past two decades focusing on advances in the clinical care and treatment of some of the world’s most debilitating diseases and medical conditions. Today, healthcare professionals consider HMP Communications’ medical journals, websites, meetings, and symposia authoritative sources for comprehensive information in the fields of podiatry, dermatology, wound care, cardiovascular care, electrophysiology, long-term care, managed care, diabetes, arthritis, and specialized primary care. HMP Communications’ journals are both peer-reviewed and non-peer-reviewed to best disseminate critical content in the most effective manner for readers. In addition to online and print media, the company produces and manages tradeshows, conferences, symposia, digital programs, and customized programs. HMP Communications Holdings LLC is the parent company of wholly-owned subsidiaries HMP Communications and North American Center for Continuing Medical Education, LLC (NACCME), a leading accredited medical education and communications company. Both companies serve the vital needs of the medical community through various business models.